Imagine this in your home: cabinet drawers that extend fully and close quietly, and cabinet doors that close quietly. Fieldstone Cabinetry drawers are standard with full extension for easy access, no glide hardware showing, and a whisper quiet close that steers even fully loaded drawers to a smooth, silent closure. 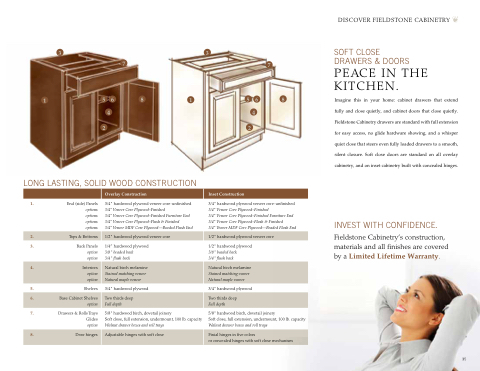 Soft close doors are standard on all overlay cabinetry, and on inset cabinetry built with concealed hinges. Fieldstone Cabinetry’s construction, materials and all finishes are covered by a Limited Lifetime Warranty.